The architecture in Monterey is a mix of adobe and colonial style. It was coined Monterey Colonial and started by Thomas Larkin who moved to Monterey from Boston in 1835. Views of the bay from Cannery Row. This year, my boyfriend surprised me with tickets to the world-famous Monterey Bay Aquarium for my birthday. I'd heard great things about not only the aquarium, but the town itself, so we decided to make a weekend trip of it. Monterey is the perfect weekend trip from San Francisco at just a two hour drive south. The town's main drag, Cannery Row, is a coastal road that was famous for the once thriving sardine canning industry, and the John Steinbeck novel by the same name. The first canning company opened in 1902 and the last closed in 1973. In the surrounding area lies the sleepy town of Pacific Grove, dreamy Carmel-by-the-Sea, and Point Lobos State Park. As soon as I arrived in Monterey, I was greeted with an instant feeling of relaxation. The weekend was full of great food, adventures at the aquarium, gorgeous views of the California coast, and a fascinating history. There was something rather enchanting and even romantic about this historic little town. In this post, I'm sharing my pick of the top 5 experiences in Monterey, as well as a suggested itinerary to help you plan your own weekend travels. Don't forget to check out where to eat, where to stay, and our TBP insider tips. Strolling Cannery Row. Fun fact: It was called Ocean View Avenue until it was officially named Cannery Row in 1958. The Monterey Bay Aquarium is the largest in California and the sixth largest in the world! You'll need at least 3 hours here and I recommend arriving before noon to avoid the crowds. The exhibits are phenomenal and the location is majestic - set right on the water where you can see sea otters not only behind glass walls, but also in the bay. You'll see penguins, a giant pacific octopus and one of the tallest aquarium exhibits in the world, the kelp forest. My favorite exhibits are the jellyfish and the sea otters. We booked a special sea otter tour where we learned about the history of the southern sea otter and went behind-the-scenes to see how the Monterey Aquarium helps rescue and release sea otters in need. They're the smallest marine mammal in all of North America and in my opinion, pretty adorable. Fun fact: Sea otters wrap themselves up in kelp forests and hold hands with their family members when they sleep so they don't lose each other. You can watch them live on this sea otter cam. Spend an afternoon strolling along Cannery Row and exploring this gorgeous street that inspired more than one great novel written by John Steinbeck. You'll pass little shops, restaurants, and old canning companies. There are peak-a-boo views of the ocean and easy access to the sand. I highly recommend watching the sunset on the beach one night. The remains of an old canning company on the water. Lovers Point Park is located just a short drive from Monterey in Pacific Grove, CA. It's a protected marine area and the perfect place to set up a picnic and spot sea otters in the wild. In the springtime, the magenta ice plant is in full bloom and creates a "magic purple carpet" on the coastline. Climbing the rocks and spotting sea otters at Lovers Point Park. The scenic 17-Mile Drive spans the Monterey Peninsula and can be easily accessed from Lover's Point Park, so I recommend starting right after your stop there. It takes you through a gated community as well as some of the most historic and scenic golf courses in the world. You'll be charged $10 per car to drive through, but it's well worth it. Make a few pit stops along the way at Spanish Bay, Pebble Beach, and the Lone Cypress. Snap some pictures of the gorgeous multi-colored ice plant (not to be confused with the seasonal magenta ice plant mentioned above) lining the coast. We spent about an hour and a half on the drive and continued until we hit Point Lobos for a hike, but timing will ultimately depend how many stops you want to make. Colorful ice plant along 17-Mile Drive. The Lone Cypress is one of the most photographed tress in all of North America and could be 250 years old! Point Lobos State Park is just south of 17-Mile Drive and was the last stop of the weekend. There are a number of trails that curve along this part of the California coast and we spent about 4 hours hiking, including a quick stop for a picnic. Originally, we had only planned on doing a short hike but the scenery was so beautiful, we didn't want to stop. It's a bit hard to see, but that's a sea otter in the water! Here is a trail map to plan your own hike. We parked on the street by the Carmelo Meadow Trail and took that a short distance to the Granite Point Trail, where we followed the coast line west around Whaler's Cove to the North Shore Trail. We stopped for a picnic and spotted a sea otter rolling around in the water! After lunch, we continued on the trail and it led us to the South Shore Trail all the way down to China Cove where we spotted a group of seals laying on the beach! The weather was perfect and the views were even better. We came across a group of tide pools and spent about 15 minutes finding anemones and watching hermit crabs scurry across the rocks. After about 3.5 hours, we decided to loop back inland along the South Plateau Trail which connects to Carmelo Meadow and that brought us directly back to the car. Breathtaking views on our Point Lobos hike. Seals sunbathing on the beach at Point Lobos. The Monterey Wharf that we passed on our walk from the hotel to Cannery Row. After some research, we decided to stay in the newly renovated Casa Munras Garden Hotel & Spa. It was walking distance from the restaurants and bars around Old Town Monterey and about a 20 minute scenic walk to Cannery Row. My favorite part was the fireplace in the middle of the room. My boyfriend and I brought a bottle of wine back to the hotel on Friday night and sipped it by the fire. Our gorgeous junior suite at the Casa Munras Garden Hotel & Spa in Monterey. Stop by this adorable patisserie for some delicious coffee and quiche. This tiny Parisian-inspired bakery has strong coffee and tasty desserts. We stopped on Saturday morning before the aquarium and sat on the porch with a morning bun and sun-dried tomato and goat cheese quiche. We came back the next day for more, but found out the hard way that this patisserie is not open on Sunday. This no-nonsense Mexican restaurant was perfect for a late lunch after the aquarium on Saturday. We stopped for some chips, salsa, and tacos before exploring Cannery Row and watching the sunset. Alvarado is situated right in Old Town Monterey and has a hip beer garden with fire pits. We didn't eat here, but saw a lot of people ordering food and it looked delicious. Whether you go for dinner or just a beer, the atmosphere is hard to beat. Ike's is a classic sandwich shop with options for everyone. We took our sandwiches to go and ate them during our Point Lobos hike. My advice - Always order the dutch crunch role! Do you like Ghost Stories and incredible food? Yes? I highly recommend 1833 for dinner. This was by far my favorite meal of the trip. Go to 1833 for mouthwatering food, impeccable service, and a trendy location in Old Town Monterey. I could write an entire post about this restaurant...but you should experience it for yourself. Make a reservation and show up 15 minutes early to sip a cocktail by the fire pits outside. Try to get a table on the balcony and order a bottle of wine, steak tartare, risotto, and a flatbread. Ask the waitstaff to tell you about John Stokes and the ghosts that still haunt this historic building. > Monterey is only a two hour drive from San Francisco! There is an airport in Monterey if you're flying into the area, but it may be friendlier on your wallet to fly into the San Jose Airport. You'll definitely need to rent a car for this trip. > While south of San Francisco, Monterey is still Northern California, so don't forget to bring a jacket! We visited in January and it was really cold at night. 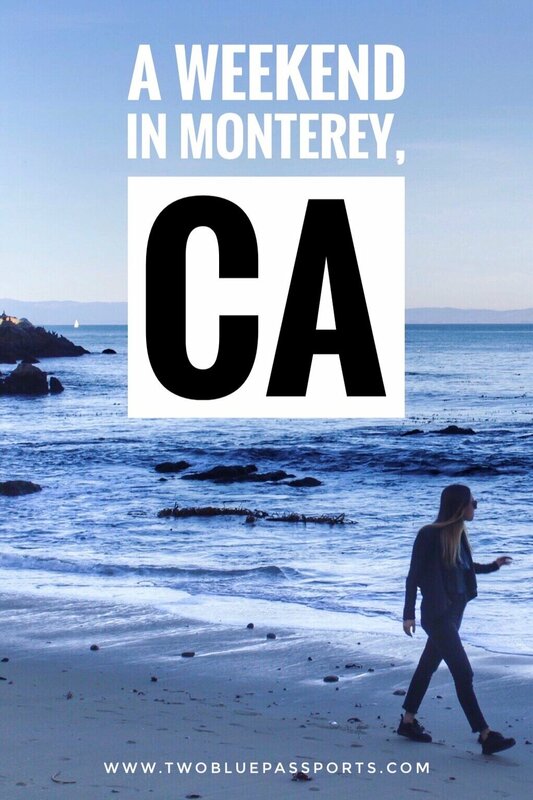 Monterey weather throughout the year rarely drops below 40 degrees or above 70 degrees Fahrenheit. > You can enjoy Monterey any time of the year, but the best time to go is in the spring or late summer. April is usually when the wild magenta ice plants are in full bloom on the coastline and September in Monterey hits the highest temperatures historically. > A lot of tourists choose to stay closer to Cannery Row than Old Town, but I recommend Old Town considering the proximity to more restaurants and nightlife. > Buy your aquarium tickets and book a tour ahead of time! > If you're looking to travel with your dog, Monterey and it's neighboring town, Carmel, are very dog friendly. Check out my friend's post sharing a dog friendly Carmel guide for more information. I plan to bring my puppy, Max, on my next trip down the coast.